Welcome to a secluded small boutique style apart/hotel, off the beaten track. 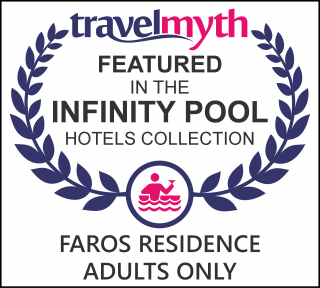 Contemporary yet colonial, Faros Suites are setting a new standard for the Kefalonian resort. Just 30 meters from the beach in the charming village of Fiskardo, the property is a tranquil place edged by turquoise waters, with secluded, expertly crafted spaces offering the best of best for its guests. Faros Suites are both a welcoming hideout and a grand departure point for all that this particularly stunning plot of paradise has to offer. The property takes pride in being located at the picturesque village of Fiscardo, where each of its suites is in harmony with its stunning surroundings without compromising the highest level of comfort and sophistication. Most with a private balcony, the self-catering, air-conditioned suites feature dark-wood furnishings and colonial elements. They are fitted with a flat-screen satellite TV and microwave, and have a living room area. In the luxurious bathrooms, guests will find bathrobes, slippers and free toiletries. From the pool, guests can soak up in the sun and indulge in the calming solitude of the area. The Faros Suites Colonial Boutique villa is located in Fiskardo, northern Kefalonia, an area surrounded by lush greenery and mountains, and contrasted by deep, calm blue seas. Certain areas of the villa are dedicated to relaxing under a blanket of trees, allowing a cool and calming afternoon enjoying one's book, or just relaxing. The pool area is a must for cooling off under hot summer afternoons. The local beach is also just 30 meters from your suite, and the waterfront just 5 minutes walk. The pool deck is surrounded by a wide variety of plants and shrubs, enveloping the area in a green and soothing atmosphere.